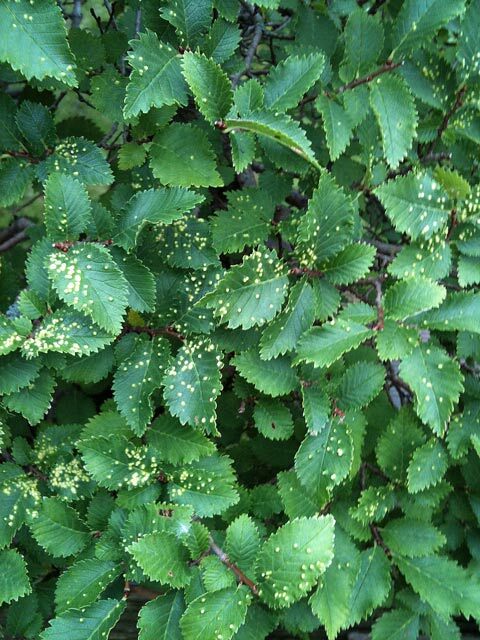 Elm gall mite is a common problem and none so more than on our bonsai Elm trees where it can be more than just an aesthetic problem. Identification of this mite is fairly easy as hard pale swellings containing microscopic mites develop on the upper surface of Elm leaves. Almost every leaf may be affected, but the tree’s vigour is not usually affected, but this is in relation to full grown trees and not bonsai. The Latin name of the mite is Aculus ulmicola and it begins feeding on the leaves in the spring. The mite uses chemicals which it injected into the leaves which induce the galls to develop on the leaves. The galls are hollow and the mites spend the summer months feeding and breeding within these structures before emerging in late summer and over wintering under bud scales. The main concern is that bonsai trees have significantly reduced leaf size and leaf coverage, and an infestation of mites can affect the long term health of bonsai trees. This is particularly so if they are subjected to repeated attacks by mites reducing the functioning of the leaves for photosynthesis. Conventional controls like the use of insecticides are less than effective with mites and the main way to reduce or remove the problem is by removing the affected leaves containing the mites and disposing of them. Repeated defoliation though does add additional stresses on the bonsai tree especially if it is not in full vigour anyway. To ensure that your bonsai trees do not become infested, it is recommended that they are kept in a healthy condition and are well fed and watered. Furthermore, phytosanitary controls are a good prevention to mites and the majority of pests which includes ensuring that any dead leaves are removed from the pot and disposed of as opposed to allowing them to decompose back into the soil in the pot. Also that the trees are repotted regulary to remove any pests that may be overwintering in the old soil prior to the onset of new growth in the spring. Finally try to avoid positioning your bonsai Elm trees in close proximity to garden hedges which may contain elms that could be the source of the mites and if you have a tree with mites then try to quarantine the tree to reduce the chances of your other Elms also getting mites. Posted July 29, 2011 by AW & filed under General Interest.